It’s been another week. Exceptionally slow for some of us and rocketing past at lightening speed for others. We stopped and smelled a few roses over the last seven days and these are a few of things that made us giggle or gasp longingly. Enjoy. click to enlarge. Really. Look at it big - totally amazing. 1. 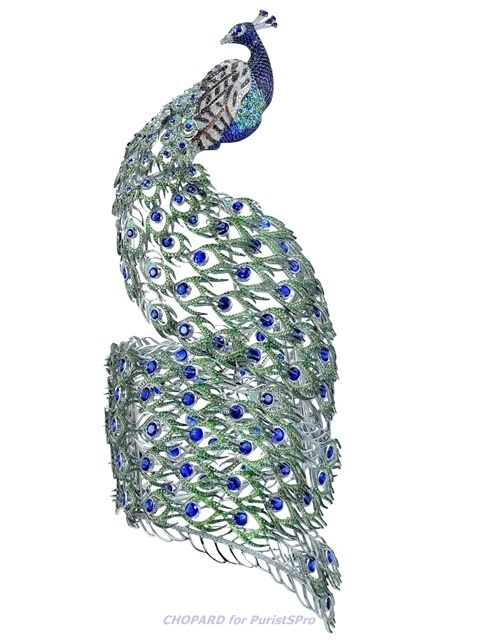 Peacock bracelet. Oh. My. Word. Isn’t this one of the most stunning pieces of jewelry you’ve ever seen? We can just imagine the tail of this gorgeous peacock winding up our arms, the lacework tickling our skin oh so seductively. There are 7,500 stones: .05mm Paraiba tourmalines, tsavorites garnets, diamonds, sapphires and emeralds. Ava swore if Ed bought it she’d wear the bracelet and nothing else. Of course, that makes the 11 year old girl make choking noises. Ignore the child. Bask in the gloriousness that is the work of art. Now, if any of you run out and buy it, we’re going to be very perturbed. Although, I can’t tell you the price as it’s listed as “pricing upon request” so that means we’re all out of the running. 2. Opportunities. Kelli called Amylynn this week and told her they would have to beg off some plans the Sister’s had for the coming weekend. It seems she has the “opportunity to go camping.” Ava and Amylynn are not completely sure Kelli has a firm grasp of the meaning of the word “opportunity.” Merriam-Webster defines it as “a favorable juncture of circumstances” and as far was Ava and Amylynn are concerned there is nothing favorable about camping. We could be bribed into if the peacock bracelet was a reward at the end, but there would still be considerable whining. police went undercover to “blow a hole in the ring of alleged crooks”. There are a lot of things to comment on here: What are Bulgarians going in Greece? What kind of wrestler – Grecco Roman or professional mask-wearing wrestler? Apparently the Mediterranean is the place to be a cop. You get to dress up as donut venders, gladiators, garbage men and tourists. 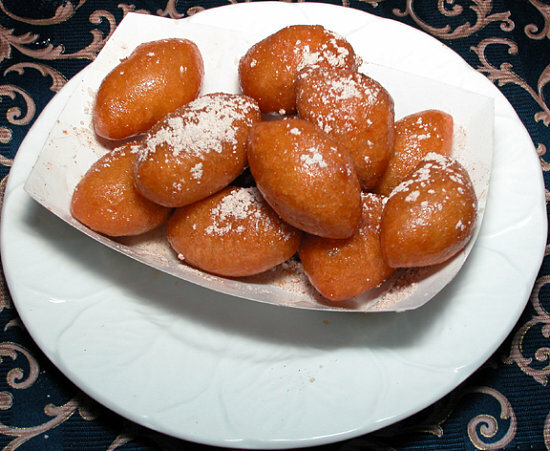 But we’re sure you’ll all agree that before we pass judgment, we need to hop on a jet and taste those donuts. 4. Umbrella lady. We’ve always referred to her as the “Parasol lady” because she always has a pretty one with her when you see her walking down the street, but apparently she is offically known as the Umbrella Lady. She is one of the charming characters of our town that everyone seems to have a story about. 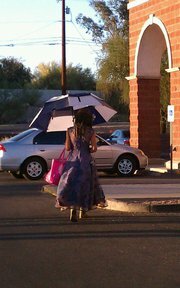 She wears outlandish dresses of the prom variety with lots of petticoats and lace and must own a gazillion parasols. She walks everywhere – even in the summer. She’s fascinating as all great characters are. We think she might be good luck but we decided it’s probably not polite to hop out of the car and rub her. 5. Prosciutto. Oh you scrumptious dry-cured Italian delicacy. We tried writing a haiku to it but we got distracted by it’s salty goodness. 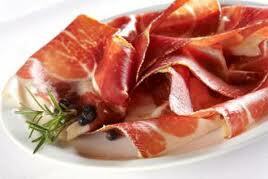 Ava’s husband is leaving this weekend for a three day prosciutto fiesta. He and a friend will spend the weekend learning how to make it. We already have plenty of experience in eating it. The Sisters are considering waiting for him at the airport with a ripe cantelope and a bottle of ice cold gewurztraminer.